LEED® in Your Future™ is a robust, forward-thinking application built to enhance your learning experience. Utilizing a sleek and easy-to-navigate design, this new app features 10 modules that cover the principles of sustainability and the LEED green building certification program. The first three modules offer overview information on the purpose of LEED, the critical importance of green building and sustainability, and the LEED Green Associate™ credentialing process. The following seven modules mirror the LEED v4 categories and offer focused material on Location and Transportation, Sustainable Sites, Water Efficiency, Energy and Atmosphere, Materials and Resources, Indoor Environmental Quality, and Innovation and Regional Priority, all of which provide the user with a better understanding of the importance of sustainable living. Each module contains a short video explaining its contents as well as a number of lessons complete with helpful checkpoint questions. Modules 4–10 include engaging learning activities, and each module provides a link to the beneficial online Study Center. 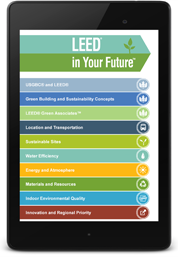 LEED® in Your Future™ App is available on the iTunes® AppStore and the Google Play™ store.